As longtime fans know, Supergirl is (usually) Kara Zor-El, Superman’s teenage/young adult cousin who also came from Krypton. Being from Krypton means Kara has the same set of powers as her famous cousin, even down to obscure ones in the Silver Age like super-ventriloquism. Supergirl’s back story has changed a lot over time, leading to some inconsistency. 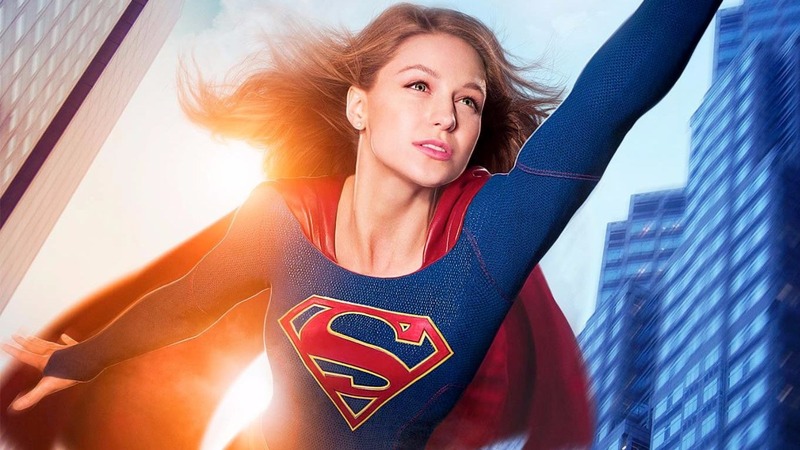 One of the more inconsistent aspects: where does Supergirl live? Unlike Superman, who only has Smallville and Metropolis associated with him, the Girl of Steel has been shown living in multiple cities over the decades. Here’s a list of Supergirl’s various towns and cities Supergirl’s been associated with in the . 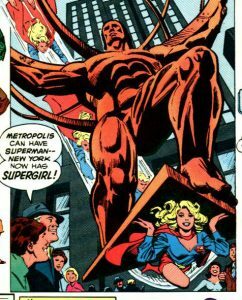 Supergirl’s original home on Earth during her earliest days was Midvale. Kara resided in the Midvale Orphanage for several years; eventually, Fred and Edna Danvers adopted her. She spent the remainder of her teen years in Midvale, before leaving for college. Midvale in pre-Crisis stories is a small town near Metropolis. Midvale still exists post-Crisis, but appears infrequently. From “Action Comics” #366 (August 1968). Art by Kurt Schaffenberger. 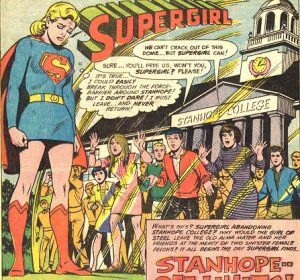 Kara left Midvale to attend Stanhope College. Stanhope’s probably a pastiche of Stanford University in California. Stanhope College is located in a town called Stanhope. A 2011 story (just before the New 52 reboot) stated that Stanhope is 50 miles (80 kilometers) west of Metropolis. Supergirl moved to fictional Santa Augusta, Florida in a 1974 story. She stayed there through the early 80s, working as a counselor at New Athens Experimental School. A flash-forward story in 1980’s “Superman Family” #200 shows an older Kara had become governor of Florida in 2000 (aka “20 years in the future”). Her older self had also changed her name to “Superwoman.” Presumably, things would’ve turned out much differently if “Crisis on Infinite Earths” hadn’t happened. Of course, Jeb Bush was governor of Florida in real life from 1999 to 2007. Bush now has his own connection to Supergirl, albeit an awkward one. “Superman Family” #208 (July 1981). Art by Ross Andru. A 1981 storyline saw Kara move to New York City. This was to take on a role as an actress in a soap opera. Supergirl also functioned as one of the city’s superheroes—though the Teen Titans already resided there, of course. In 1982, Supergirl got her own comic again. Her new series saw Kara quit her soap opera gig and move to Chicago. There, she enrolled in fictional “Lake Shore University.” Apparently, the Maid of Might loves higher education. For a period of time, the shape-shifting “Matrix” Supergirl lived with the Kents in Smallville while adjusting to Earth life. Long story short, this Supergirl is from an alternate “pocket universe” dimension. Said dimension originated as a kludge to fix “Crisis” erasing the original Superboy from continuity. This, of course, had thrown the Legion of Super-Heroes book for a loop. “Superman: The Animated Series” also shows the Kent farm and Smallville as Kara’s home. The Matrix Supergirl spent time in Metropolis. There, she’d fallen in love with Lex Luthor, Jr., the supposed Australian son of the “deceased” Lex Sr. Unbeknownst to her, Lex Jr. was really regular old Lex in a cloned body. On top of that, he was planning to clone her in turn for his own evil ends. Supergirl found out and put an end to their relationship (and Lex’s plans). This Supergirl lived in Leesburg, Virginia, a real-life small town near Washington, DC. As of 2016, National City’s officially become incorporated into mainstream DC Comics as one of its numerous fictional cities, alongside Metropolis, Central City, and Smallville. The DCU version of National City was first mentioned in “Batman/Superman” #31 (June 2016), and first appeared in “Action Comics” (vol. 2) #51 (June 2016). That sums up the cities in which Supergirl’s lived. I didn’t include off-Earth locations like New Krypton, a Kryptonian settlement from a 2000s storyline, or Argo City, her original Kryptonian hometown. Suffice it to say the Girl of Steel’s moved around quite a bit. Of course, the number of costumes Supergirl’s had is probably twice the length of the list above (minimum). But that’s something I’ll leave for someone else to cover. As a life-long Chicagoan, I’m partial to her Chicago years. Now I want to pick up some Supergirl comes where Chicago plays an important role in the story. JarrietFair aka black Vulcan. I love supergirl. I have seen the movie. And I can’t wait to see her tv series on CBS. I’m sure it will be a good series. Just like superman and smallville and Lois and Clark series. I will love watching this series. Perhaps “National City” is a call-out to National Comics, the predecessor to Detective Comics, then DC. I, for one, enjoyed Peter David’s “Earth-born Angel” series, largely for his writing but also for his attempt to blend spiritual elements into a super-hero comic. It does get kind of zany in the retelling, though. Perhaps so re: National City’s name!